There is probably no better place for a classic film festival than Lyon, France. After all, it’s the hometown of brothers Auguste and Louis Lumière who developed the Cinematographe projector and whose Workers Leaving the Lumière Factory in Lyon, a 46-second documentary first shown in 1895, is considered the first motion picture ever made. All these years later audiences from near and far still enjoy the early works of film pioneers and of current filmmakers right where the industry was born at what is now known as the Institut Lumière. 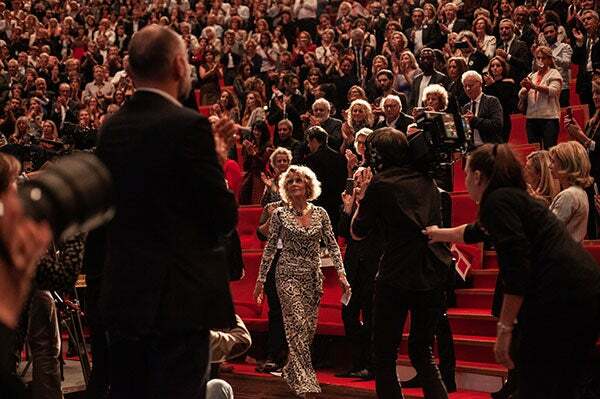 The Festival Lumière launched its 10th-anniversary edition in front of an audience of 5000 people with a gigantic confetti burst and an opening night screening of Itinéraire d’un enfant gaté, the 1988 collaboration of French icons Jean-Paul Belmondo and director Claude Lelouch. 10 days later it ended with a weekend of Hollywood glamour when Jane Fonda received the Prix Lumière and the Festival closed with a showing of John Ford’s The Grapes of Wrath starring her father Henry Fonda. Fonda charmed the audiences at several events including a master class at the Théâtre des Célestins and the Prix Lumière ceremony, conversing and singing songs in French that her first husband Roger Vadim taught her “among other things”. 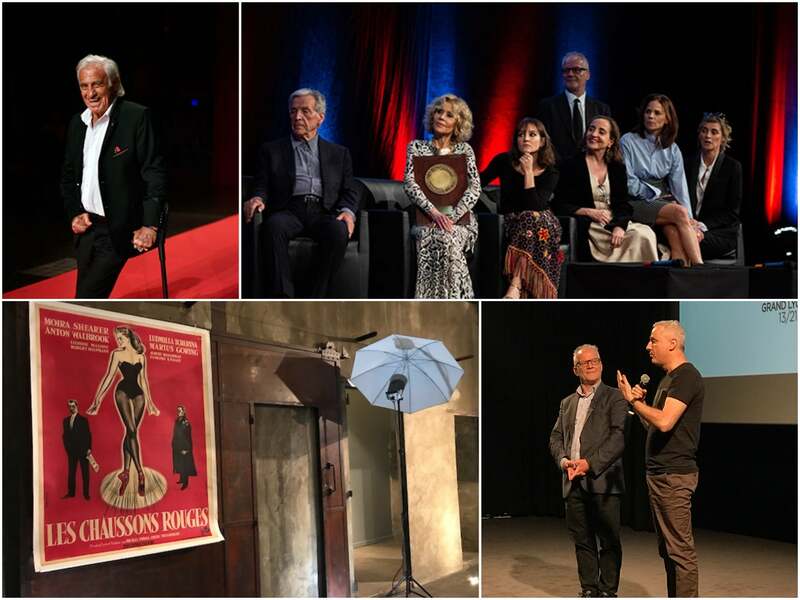 (Clockwise from top left): Jean Paul Belmondo; Jane Fonda and her award; Thierry Frémaux and director Robin Campillo; The Red Shoes, restored with a grant from the HFPA, at the festival. And Fonda tried her hand at something she had never done before: directing. As it has become a tradition at the festival - and to the amusement of the people at the Institut Lumière - Fonda directed the “remake” of Workers Leaving the Lumière Factory. Under Fonda’s updated direction and instruction, the “workers” have won a 30 Euros salary increase per day and run out of the same location of the original film, now the “Hangar du Premier Film”, jumping for joy. In on the fun were actors Rossy de Palma and Tahar Rahim (The Looming Tower) who played workers while director Constantin Costa-Gavras, who was René Clément’s assistant director in Fonda’s first French film Les félins (Joy House), played a union organizer who brings the workers the good news. 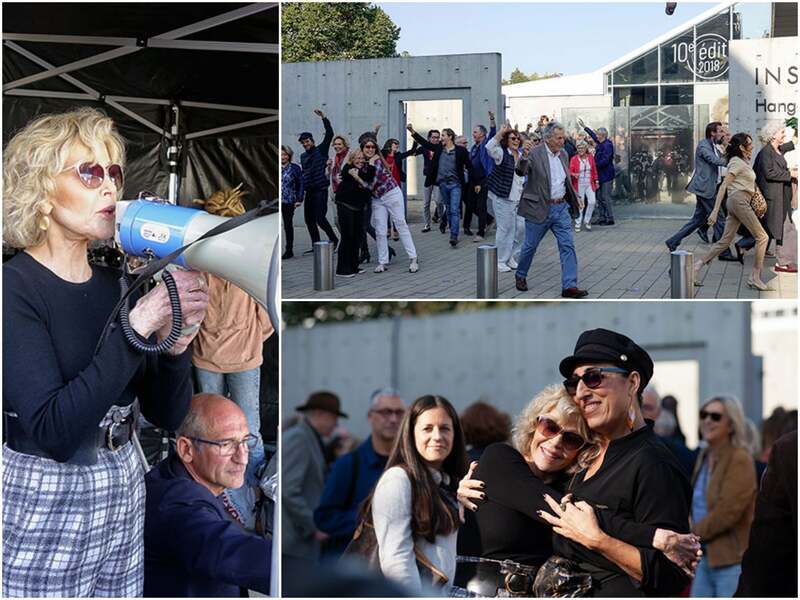 Jane Fonda also celebrated the 50th anniversary of her activism: “It all started when I was living in Paris in 1968 and met American soldiers who were against the war in Vietnam”, she said during her Master Class. Even though later that night she would sing along to the Edith Piaf classic “Je ne regrette rien”, she still regrets (and apologized for) the photos she took on a Vietnamese anti-aircraft gun during the war: “It was a terrible thing and I’m still paying for it today”, she told the audience. Jane Fonda directs the re-enactment of the Lumière Brothers' Workers Leaving the Lumière Factory, with an assist from some very famous "workers", including Rossy de Palma, Constantin Costa-Gavras and Tahar Ramin. The HFPA partnered with the Festival Lumière this year with a special screening of The Red Shoes (1948) by Michael Powell and Emeric Pressburger. The film was restored by the UCLA Film and Television Archives with a grant from the HFPA. President Meher Tatna also announced (in French!) that the HFPA will financially contribute to the restoration of the second phase of 300 short films by the Lumière brothers, a project by Institut Lumière and the Laboratory of Cineteca di Bologna. 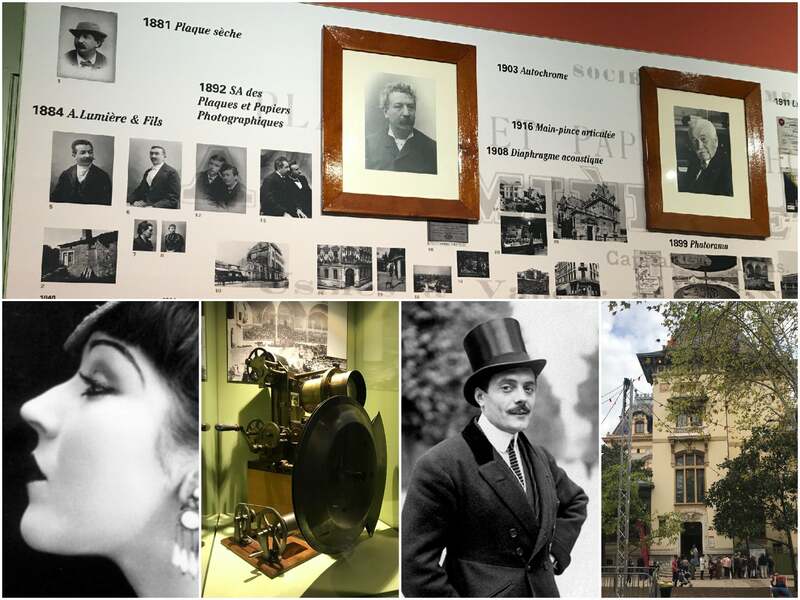 At the Musée Lumière: (top) a timeline of the moving image; (bttom, from left) Catherine Hessling; a vintage projetor; Max Linder; the Musée Lumière. Some of the highlights in the silent movie section: a tribute to Max Linder, considered the first international silent movie star who inspired and later befriended Charlie Chaplin. He made several hundred comedy shorts in which he played the dapper dandy Max, always getting into trouble. After having served in WW I as a dispatch driver between Paris and the frontline, Linder suffered several health problems including depression and in 1925 he and his young wife were found dead in their hotel room, murder-suicide being the most likely cause. Thierry Frémaux announced the creation of the Max and Maud Linder Institut, named after the star and his recently deceased daughter Maud who left her father’s films to the Institut Lumière. Special attention was given to women filmmakers: aside from Muriel Box, Norwegian actress Liv Ullmann and Lebanese singer/dancer/actress Biyouna were honored with retrospectives. Silent movie highlights were shown of Catherine Hessling who started out as a model for Auguste Renoir and later married his son and filmmaker Jean Renoir and became his muse, starring in films like La fille de l’eau and Nana (bravo to pianist Didier Martel who accompanied the 2h48 film without a break during the Tuesday morning screening). Prix Lumière recipient Jane Fonda whet audiences’ appetite for more films from the forgotten female point of view with a clip of the documentary Women Make Films: A New Road Movie Through Cinema, a rediscovery of women filmmakers throughout the world, directed by Mark Cousins and narrated by Tilda Swinton and Fonda herself. And yes, there were also a few movies to be seen at the festival that still hope to become classics at the Festival Lumière: Javier Bardem and Alfonso Cuarón brought their new films Everybody Knows and Roma respectively. And Claire Denis premiered High Life, a film about harvesting energy and procreation in outer space starring Robert Pattinson and Juliette Binoche. Venice Celebrates Jane Fonda and Robert Redford, "the Best of Hollywood"